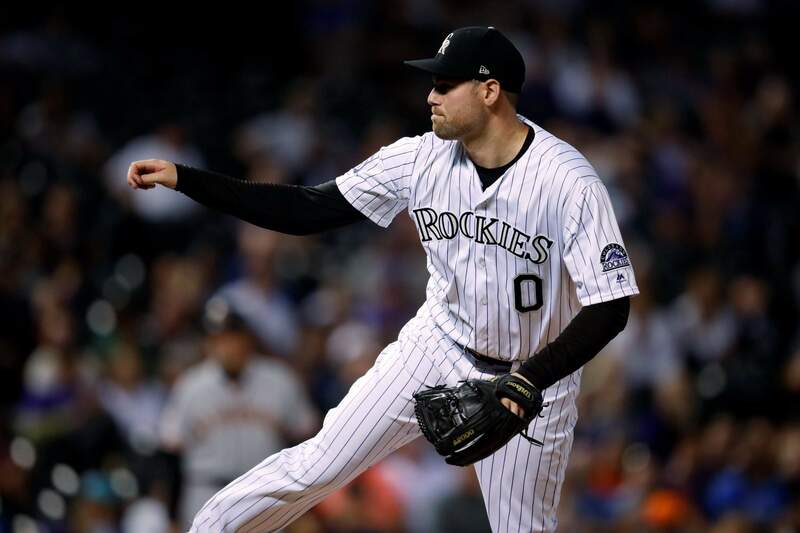 Colorado Rockies reliever Adam Ottavino watches a pitch to a San Francisco Giants batter during the eighth inning of a game Tuesday in Denver. Colorado Rockies left fielder David Dahl, back, dives to catch a fly ball by San Francisco Giants’ Brandon Crawford to end the top of the eighth inning Tuesday in Denver. TRAINING ROOMGiants: CF Steven Duggar underwent season-ending surgery Tuesday to repair a torn labrum in his left shoulder. “All went well,” manager Bruce Bochy said. “He came out of it fine.” Duggar suffered the injury a week ago diving back into second base. He’s expected to be ready in time for spring training. GIANTS MOVESRHP Jeff Samardzija (right shoulder inflammation) has been transferred to the 60-day disabled list and INF Abiatal Avelino had his contract purchased from Triple-A Sacramento. He is awaiting his major league debut. ROCKIES MOVESRHP D.J. Johnson had his contract selected from Triple-A Albuquerque and is making his debut on a major league roster. INF Garrett Hampson, LHP Sam Howard and OF Ramiel Tapia were all recalled from Albuquerque. Hampson, Howard and Tapia all spent time with the Rockies earlier this season.